These photographs were taken at various underwater locations on the South Australian Coast. They include, Port Noarlunga, Stenhouse Bay, Edithburgh, Port Hughes, Offshore Glenelg, and Rapid Bay. Cameras used for taking the Photos in this Gallery, and their lens and flashes are listed with each photograph. "This Gallery will have more photos soon as we are scanning slides that will feature underwater life, of the 1970's, 1980's, 1990's around South Australia." 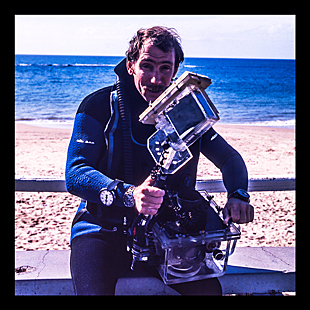 Myself in the 1970's with my home made underwater housing for my Bronica S2A 6x6 and Metz Flash. 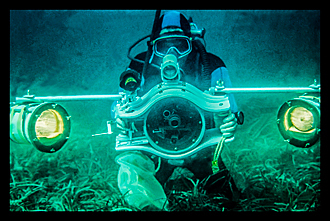 Myself again in the 1970's with my Bolex 16mm Movie camera and movie lights in underwater housings that I designed and also built.